Marjolie was 9 years old when I did this pencil drawing. She was one of 12 or so children who played in the streets of Lome, Togo where we lived for a year. Deb, my wife was teaching at the American international School. I was doing some graphics for the UN’s aids program. I was very taken with the kids. They were so kind to each other and played together in the sandy streets for hours. Playing soccer with a dried orange or devising games with sticks or well used and broken toys. These kids were unashamed of their bodies. I couldn’t imagine a youngster running around with their friends in their underpants anywhere else I have lived. Marjolie was a standout, taller, stronger, and simply beautiful, she was a natural leader. and her friends seemed fine with that. The profound impressions gained by interacting with the kids were not even remotely major events, but rather the matter of fact ways displayed when doing things all kids do. Here’s a small example. The kids loved to have their picture taken. I had a very early digital camera (1.5 megapixel) with a small display screen. Looking at themselves in the little display was a huge thrill. I was very moved when I first started taking pictures of the kids. It was very important for them to include as many of their friends as possible in the shot. Marjolie was an enforcer of this. Instead of, ‘hurry up before everyone else gets here” It was, “wait they are coming” and until a small crowd of all availabe kids visible from one end of the block to the other were assembled, pictures were not allowed. This drawing from a shot I managed while she was awaiting friends she had just summoned shows her serious resolve. She didn’t want to have a picture taken without a lot of friends. I just love that. 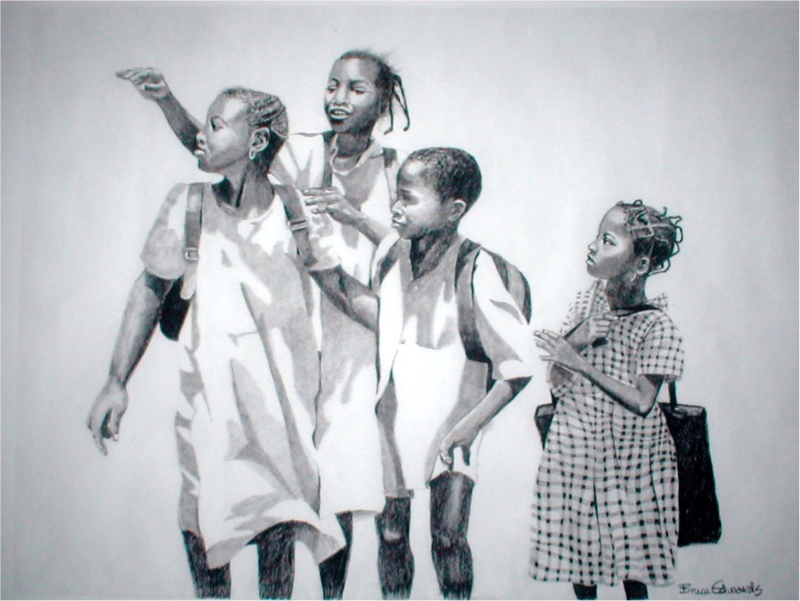 Here is a graphite drawing showing the kids calling their friends over. They are just coming home from school and found me and my camera. That’s Marjolie front left.